The shutdown continues as the U.S. inches closer to the debt ceiling. Meetings are happening, and even when they don’t, it seems that it’s simply to hash out more negotiations. There are hopeful signs, but what if they can’t make a deal? In the Crossfire tonight, Carly Fiorina, a former CEO, and Austan Goolsbee, former Obama economic adviser, join hosts Stephanie Cutter and Newt Gingrich at 6:30pET. They’ll debate the possible consequences of a debt ceiling breach and break down the economics of it all. 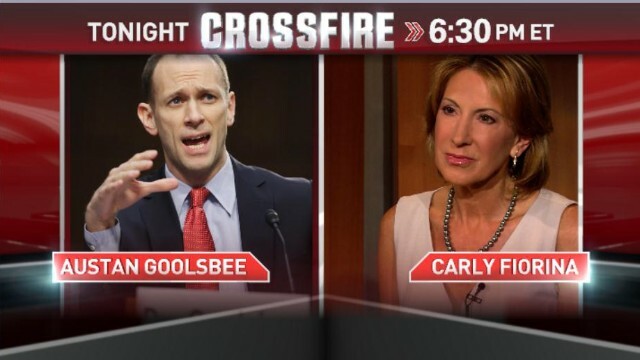 Join the conversation and tell us what you would ask Fiorina and Goolsbee by tweeting with #Crossfire. We want you to weigh in. Are you optimistic that a deal will pass Congress this week? Reply now below, by replying to our tweet or by commenting on our Facebook post. Elected officials are famous for procrastination. Sometimes it works and sometimes it doesn't, even when it's at the last minute. I feel this time around, there's not enough time because you have wasted so much time in the past to where you won't get the deal moved. There's been plenty of notice in advance about this deadline and you all know it! It's a shame the way our government is being run. The world is fixing to be in a dire financial crisis which can lead to a recession and it will. Here's our leader in command the President, off making "Peanut Butter and Jelly" sandwiches. How ridiculous!! The entire country knows how bad everyone has been hit from this shutdown, because your the ones who made the impactions upon the country. All of this could have and should have been avoided. If you all would just get along, act like civil people and take your jobs seriously learn and learn how to meet deadlines like everyone else has to do in his or her job. Most people don't get paid for not doing their jobs! There will be another escalation of the same thing come January. Somehow, someway, you all need to get your acts together and figure out a long term solution and realize that a short term solution is solving nothing and wasting your time and everyone else's dime. The shutdown has cost millions! Is it even worth it, no it's not!! So why keep procrastinating on everything you are expected to do out of your job. Get up, go to work, and just do your job or consider yourselves to be not re-electable because your not in it for the American people. It shows 100% that your all about yourselves and your party names. since congress is part of the government and the government shut down and some people are not paid, why dont the congress forfiet their pay also? Fiorina is a fountain of knowledge and I especially appreciated her eloquent differentiation between debt increase and default. Gingrich is always articulate and Goolsbee was interesting, but must Stephanie Cutter be co-host? Her in-the-mud partisan nastiness is immature and off-putting and prevents Crossfire from being an intellectual forum worthy of my DVR. I totally agree , her nasty and partisan remarks are uncalled for and don't contribute anything to the discussion. Her demeanor and smirks are off-putting and has made us quite often change the channel. How come there is all this fuss about Obama not 'negotiating' when the GOP was AWOL from the budget reconciliation conference for months? Carly is so mistaken. The processes are in place. The problem is that TPRepublicans do not respect processes and refuse to follow them. Carly is being made to look so ill-informed. She is merely regurgitating the ill-conceived TPRepublican talking points. It is no wonder that HP got rid of her. It has been doing better ever since her departure. Carly Fiorina is not telling the truth. Carly you claim the Republicans gave in by allowing for Revenue increases last year and therefore have to do nothing. What you fail to admit is that the Democrats have given in on the budget cycle by agreeing to a budget resolution which funds the US government at the TPRepublican budget cut level of $900+B, which is the sequester level. The Democrats wanted a much higher level but gave in to the TPRepublicans, asking in turn for a clean CR at $900+B. So each side has given: TPRepubs to some Revenue and Dems to some spending cuts. So the slate is balanced. Time to start again. Your failure to admit that shows that you clearly are aligned with the misinformation TPRepublicans who cannot have an honest debate with Democrats in Washington or the American people. We borrow money about 3.2 billion for Israel and similar amounts for Egypt, Afghanistan and Pakistan and just give it to them with a hocus pocus string attached. They must spend a predetermined amount purchasing weapons from USA arms manufacturers. The money that we give Israel amounts to $400 for every man woman and child much of which is subsidizing Lockheed Martin. Lockheed has the biggest lobby in DC and spends millions in DC to get their contracts. Lockheed gathered up in 2012 well over 42 billion dollars from military contracts and aid packages.